The V6 is gone, but Altima's new variable-compression turbo 2.0-liter will (almost) make up for it. At the 2018 New York Auto Show, Nissan pulled the wraps off what could possibly be the biggest change to the Altima ever in its 26 year history. 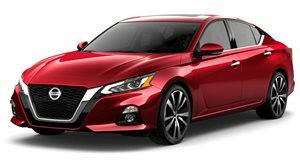 In a bid to stave off sales losses in the midsize sedan segment, Nissan is throwing everything it can at the Altima, including a new 2.0-liter variable-compression turbo four cylinder (which replaces the 3.5-liter V6), a heavily revised 2.5-liter naturally aspirated four-pot, and the model's first AWD system. It's no secret the midsize sedan segment is under threat from crossovers and SUVs. In response, Nissan has fully redesigned its top-selling car to make it a more desirable alternative. Up front, the Altima has a brand new look that simplifies its headlights and places them on either side of a larger, deeper Vmotion grille inspired by the Vmotion 2.0 concept. A similar rework of its taillights has resulted in more horizontal, angular lenses. In profile, Altima ditches its bulbous haunches in favor of a smoother, faster, more streamlined look with a character line running just below the belt line. Nissan's signature floating roof treatment also makes an appearance for the first time on Altima. The new sheetmetal is affixed to a longer, lower, and wider chassis for improved handling and space, while its reworked base 2.5-liter four-cylinder engine now develops 188 horsepower at 6,000 rpm and 180 lb-ft of torque at 3,600 rpm. The new, variable-compression 2.0-liter turbo four—which the Altima borrowed from the Infiniti QX50—cranks out 248 hp at 5,600 rpm and 273 lb-ft of torque, but only when running on premium fuel. With those numbers, the new turbo mill is down 22 hp versus the outgoing V6, but it gains 22 lb-ft of torque and will effort a "double-digit percentage increase in fuel economy," Nissan claimed. All-wheel drive is a new available driveline option, but it can only be mated to the base 2.5-liter engine. As before, Altima will use a continuously variable transmission, though paddle shifters for stepped shifting are available. The 2019 Nissan Altima will arrive TKTK in five trim levels—S, SR, SV, SL and Platinum—plus an exclusive launch edition of the VC-Turbo model available only in the first year. Order books for the launch edition open this summer.